All tests were run in our custom-built computer to best reflect real life performance. The computer remained in the same place and room for all tests. The ambient temperature of the room was roughly 22 degrees Celsius. The thermal paste applied to each cooler was stock respective to their manufacturers to rate its performance. Sufficient time between testing was applied for the paste to settle. The fans on all heatsinks were connected to the same motherboard 4-pin connector. The test computer was turned on and idling for at least one hour for the idling tests. High CPU load results were obtained using the Prime95 in place large FFTs test with four worker threads for a minimum of fifteen minutes and recorded when the temperature was deemed stable. The Justice RC-1204 was tested using the stock fan from the factory. The performance was compared with two other air-cooled CPU coolers, namely the Reeven Ouranos RC-1401 and the Scythe Mugen 5. The purpose of doing such tests was not for a performance competition, since they were quite different in terms of fan size; it is only for relative performance comparison. 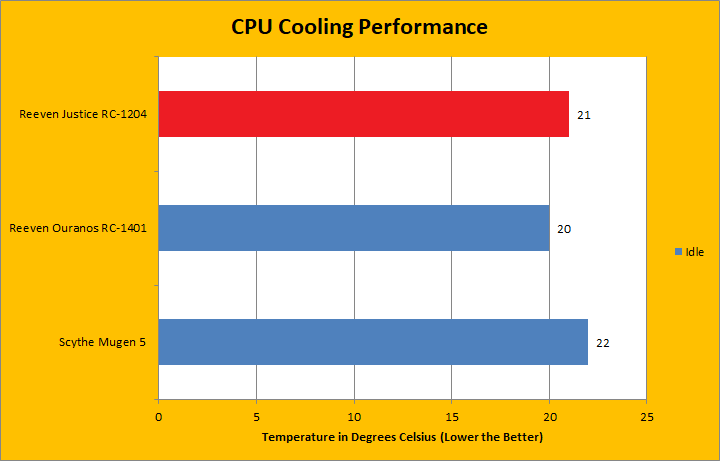 The temperature results for each cooler was measured with CoreTemp, which reports the CPU's integrated digital thermal sensor for maximum accuracy. Each temperature result was calculated by taking the maximum value of the cores inside the CPU. In the idle test, the three coolers had similar results. The Reeven Justice RC-1204 stabilized at 21 degrees Celsius. It was a pretty good result, considering the ambient room temperature was around 22 degrees Celsius. The temperature at idle state differed slightly between the Justice RC-1204 and the Ouranos RC-1401. The Ouranos RC-1401, on the other hand, brought the temperature down to 20 degrees. At idle state, the Justice RC-1204 did not perform as good as the Ouranos RC-1401. I think the reason is because the Ouranos RC-1401 had a 140mm fan, while the Justice RC-1204 only had a 120mm fan. 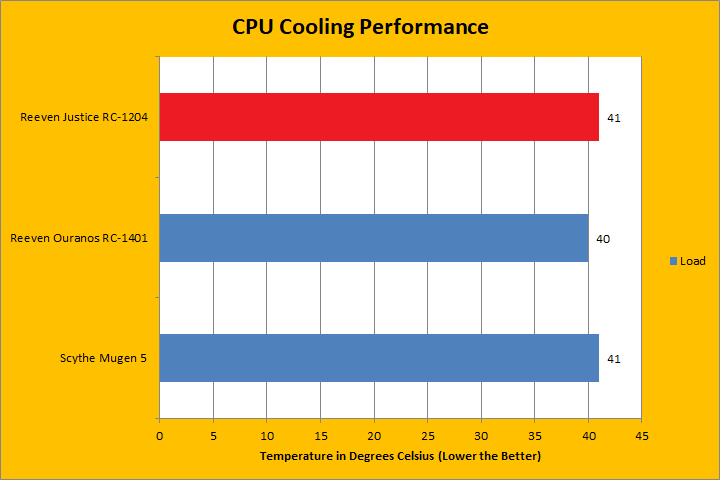 In fact, the little difference in terms of cooling performance at idle state is totally acceptable. On the other hand, if compared against the Scythe Mugen 5 at the idle state, which also had a 120mm fan, the Reeven Justice RC-1204 actually provided slightly better performance. The real challenge happened when the CPU was working at high load. Along with the increased processing speed of the CPU, the fan’s RPM also reached the maximum. After about half an hour, the Reeven Justice RC-1204 kept the temperature constant at 41 degrees Celsius. Today’s review unit came in one degree higher compared to the Ouranos RC-1401. Please note regarding the single fan performance, the Reeven's Coldwing 14 PWM is better than the Justice RC-1204's 12025 PWM in terms of maximum airflow. Therefore, with a higher performance fan, the Reeven Ouranos RC-1401 defeated the Justice RC-1204. However, as you can see above, the temperature difference between the two products was rather small. I believe with a good design, even the CPU cooler that has a smaller fan can provide similar cooling performance as the one with a bigger fan. Interestingly, the Reeven Justice RC-1204 had the same performance as the Scythe Mugen 5 when the CPU was running at full payload. It is worth mentioning the fan from Justice RC-1204 has much higher maximum air flow comparing with the fan from the Mugen 5. Therefore, the Justice RC-1204 may potentially achieve better cooling performance than the Mugen 5 when dealing with the higher performance CPUs. All in all, Reeven Justice RC-1204 has the ability to keep the CPU reasonably cool at high workloads. I am the kind of person who really cares about the noise level of my computer. In this case, I only had one fan running on the air-cooled heatsink, but is important to note there were three other fans inside the case. On a scale of 0 to 10, where 0 is totally silent and 10 is a jet taking off, I would rate the Reeven Justice RC-1204 at 2.0/10 and 3.0/10 regarding noise emissions at idle and high load, respectively. The Reeven 12025 PWM was really quiet at low RPM thanks to the sleeve bearing. 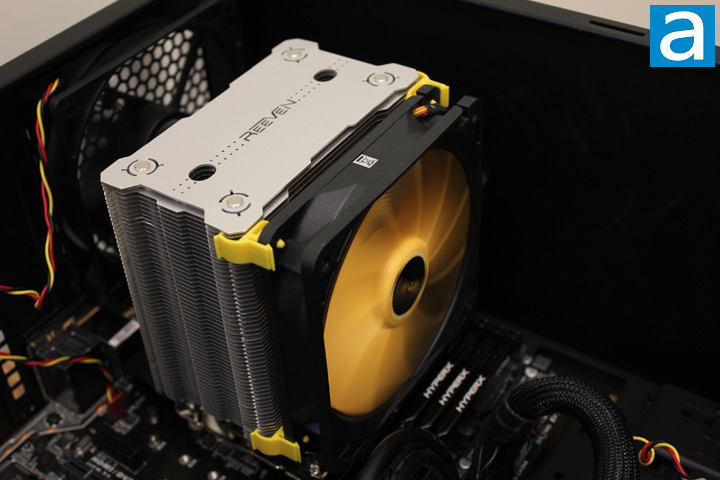 However, the fan can be a little bit noisy at higher RPMs. Overall speaking, the Justice RC-1204 had very good performance despite having a smaller fan than the Ouranos RC-1401. After all the tests were done, I would like to say that the Reeven Justice RC-1204 is a well-balanced CPU cooler with a 120mm fan. Why is that? Because it had good cooling performance as measured above and acceptable subjective noise level test results. posted 10 hours and 46 minutes ago, with 11 posts. posted 13 hours and 1 minute ago, with 8 posts. posted 21 hours and 37 minutes ago, with 2 posts. posted 1 day and 14 hours ago, with 2 posts. posted 1 day and 14 hours ago, with 3 posts. posted 1 day and 14 hours ago, with 10 posts. posted 1 day and 14 hours ago, with 11 posts. posted 1 day and 14 hours ago, with 55 posts.